Ocean View 3BR / 3BA a partir de $ 299 por noite! Nosso luxo e totalmente equipado 3 bed / 3 banho condomínio está localizado no belo ensolarado sul de Maui em Kihei no 'KAMAOLE SANDS', situado em uma propriedade luxuriante, paisagístico tropical e do outro lado do Kamaole Beach Park III, um dos mais belas praias em Maui. Este condomínio foi completamente remodelado em agosto de 2014. Está totalmente equipado incl. todos os novos colchões estilo Tempurpedic (2 king plus 2 queen), cozinha completa, incluindo microondas, máquina de gelo, lava-louça, máquina de lavar / secar roupa, ar condicionado (em todos os três quartos e na área de estar / jantar cozinha) além de grandes ventiladores de teto . TV de tela plana inteligente em todos os quartos, bem como na sala de estar, TV a cabo, DVD, acesso gratuito à Internet sem fio de alta velocidade, estéreo, telefone, grande corte com área de dormir na sala de estar, estacionamento gratuito e uma oferta adequada de roupa de cama, Toalhas e toalhas de praia para garantir o seu conforto completo. Há também dois Pack-n-Play disponíveis (gratuitos). Um kit inicial de Sabonete para as Mãos, Detergente para a Roupa, Saboneteira, Papel Higiênico e Toalhas de Papel para Cozinha é fornecido. Shampoo, condicionador e Gel de banho são itens pessoais e não são fornecidos, por favor, traga o seu próprio. O condomínio está localizado no edifício desejável # 5, a poucos passos de distância da área da piscina e aprox. 3 minutos a pé da praia. Um novo grande sofá secional na sala de estar, que pode ser convertido em uma área de dormir para dois. Esta unidade possui 2 vagas de estacionamento privativas (gratuitas e bem ao lado do elevador) e está totalmente equipada, incluindo um fornecimento adequado de roupa de cama, toalhas, toalhas de praia, cadeiras de praia e um refrigerador de praia para garantir o seu conforto completo. No Resort há oito churrasqueiras, quatro quadras de tênis, uma piscina rasa, deck de sol e duas jacuzzis separadas, uma academia e um centro de Internet. Lições gratuitas de grupo para o tênis com um profissional de ensino certificado todas as quintas-feiras de manhã, além de um torneio gratuito "drop in" todos os dias às 17h para conhecer outros jogadores. O 'KAMAOLE SANDS' está a poucos minutos do World Class Golf Courses em Makena e Wailea, e a uma curta caminhada de lojas e restaurantes. Aloha e Mahalo nui loa do ensolarado sul de Maui. This condo is an absolute gem. The owners have placed so much love and pride into it! Everything about it is so thoughtful - and tasteful. The kitchen is perfectly stocked with everything that you would need to cook. There are fluffy towels in the bathroom and separate towels to take to the beach. The mattresses are wonderful and we all got a great night’s sleep. And we got to meet the owners and they were as kind as can be. We truly enjoyed our stay! The condo was well furnished and in great condition. We were a short walk from the beach as well the pool area. The owners were in touch with us, making sure that we were happy. All in all a great place for a family vacation. Thank you so much for booking with us and your great review. We are happy to hear that you have enjoyed your stay on Maui and at our condo. Thank you also for treading our condo like your own home and leaving it in an immaculate condition. We hope to see you back here in paradise soon. Spacious clean condo. Well appointed kitchen. My family really enjoyed our stay , and I would recommend this condo . Nick & Betty's place is beautifully renovated and suited our family of 6! Nick & Betty greeted us upon arrival and it was lovely to meet them. Kamaole Sands is very clean and grounds are maintained. 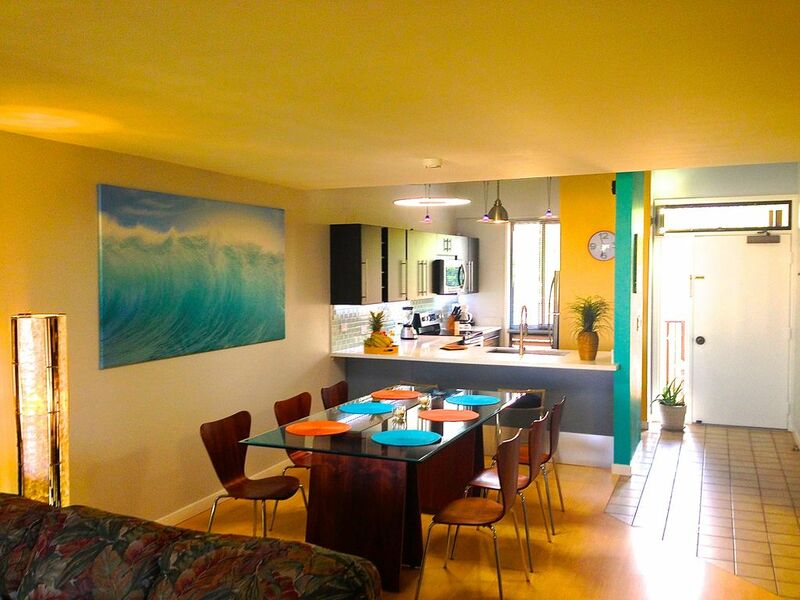 Great location to the beach 3 and walking distance to stores and restaurants. We will definitely come back to this unit! Janice and her family and friends are amazing guests. Extremely friendly people; they have treated our condo like their own home. Even our cleaning crew was amazed how clean they have left the condo, thank you so much for booking with us, we really hope to welcome you back here in paradise very soon!! Three couples stayed two weeks in January. The property is actually as pictured and advertised. Nick and Betty answered all questions asked before booking and communicated directly before and after checking in. No surprises. The condo gave each couple their own bedroom and bathroom which was important to us. The deck fits 6 chairs which worked perfectly for morning coffee and drinks in the evening to watch the sunset. Loved the easy access to the three beaches starting across the street. Easy walkability to at least 5 restaurants and the Red Raft whale watching tours. Highly recommend going to Orientation presentation by the pool the morning after you arrive. The concierge was able to make reservations for activities & answer questions as this was our first visit to Maui...it was not a timeshare presentation. There were beach towels and an assortment of outdoor chairs. You can also rent umbrellas & more beach chairs at the concierge if you require more. Two parking spaces. are provided & there was seldom a wait for the elevator. Perfect location to stay on Maui! We had a great time and loved your updated, clean, convenient, and comfortable condo. A one time resort fee of approx. $36 will be charged from the front office at check in.